Denise Jonas today shared a video from the roka ceremony of her son Nick Jonas and Priyanka Chopra. In the video, we see her trying to match steps with Priyanka's mother Madhu Chopra on a hit Punjabi number. Priyanka Chopra hosted Nick Jonas’ family in India. Photos and videos from Priyanka Chopra and Nick Jonas’ roka ceremony and engagement party are still popping up on social media, leaving fans of the two stars excited. The latest video from the celebration has surfaced on Nick’s mother Denise Jonas’ Instagram account. Mama Jonas has shared a video from the roka ceremony of her son. In the video, we see her trying to match steps with Priyanka’s mother Madhu Chopra on a hit Punjabi number. “Thank you @madhumalati for being patient with my lack of dance skills! I miss you. #engagementparty,” read the caption of the video. She shared the same video on her Instagram story and wrote ‘Family’ as the caption. Priyanka hosted Nick’s family in India. They arrived a day prior to the actor’s engagement ceremony and attended the roka ceremony which took place according to Hindu traditions. Later, in the evening, the Quantico actor invited her close friends for an intimate dinner party at her residence in Mumbai. 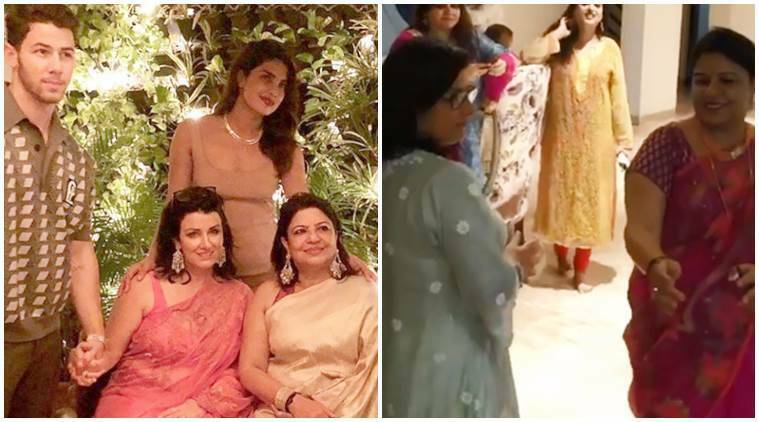 While the rumours of the couple’s wedding are doing the rounds, PeeCee’s mother Madhu Chopra has clarified that both Priyanka and Nick are busy with their work commitments. She also revealed that her daughter and future son-in-law haven’t zeroed in on the venue and date for their nuptials.